Segmented, bipartite linear, ssRNA(+) genome composed of RNA1=3.1 kb and RNA2=1.4 kb. Each genome segment 5' end is capped. The 3’end has no poly (A) tract. The virion RNA is infectious and serves as both the genome and viral messenger RNA. RNA1 encodes directly the RNA-dependent RNA polymerase (protein A), and RNA2, the capsid protein. A subgenomic RNA (sgRNA3), 3' co-linear to RNA1 is also produced and encode proteins B1 and B2. The viral RNA-1 is translated to produce the RdRp protein. Expression of the subgenomic RNA-3. Translation of RNA-2 encoding capsid protein alpha. Virus assembly in the cytoplasm around genomic RNA1 and RNA2. 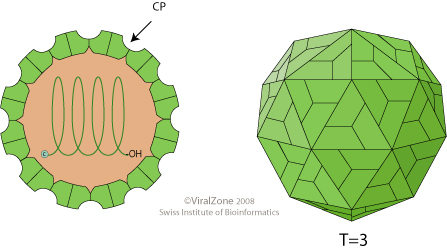 Assembled capsid protein alpha is cleaved into capsid protein beta and gamma. ORIGIN OF NAME Noda is from *Noda*mura, a Japanese village where NoV was isolated. ASSOCIATED DISEASES Viral encephalopathy and retinopathy. TRANSMISSION Passive diffusion through water or direct contact. Striped jack nervous necrosis virus B protein acts as a suppressor of RNA silencing .